‘Night Train to Terror’ opens with a song. I hope you like this song because you’re going to be hearing it a lot. A band seems to be running rampant throughout a train, singing about 'Everyone having something to do, except you.' I can only assume they mean you, the viewer. Elsewhere on the train, a conductor checks up on God and Satan as they haggle over the fate of souls. Each batch of souls gets a story and the story appears in the window of their train car. The first story involves a doctor at an insane asylum that likes to abduct people and perform pointless operations on them. The second story is about a couple that get involved with an exclusive club that uses increasingly more ridiculous “Russian Roulette” contraptions to kill its own members, and when the first contraption involves a wasp the size of a house cat, that’s saying something. The final and longest story has Cameron Mitchell chasing down a bunch of stop motion demons. It’s all wrapped up with more music, more dancing and the worst model train in the history of cinema. The first story is from an uncompleted film called, ‘Scream Your Head Off‘ and it shows, there is no real narrative to speak of, just an endless series of victims and crazy surgeons. The last two segments are edited down from existing films, 'Death Wish Club' (1983) and 'Cataclysm' (1980), and as a result they feel rushed and possibly make even less sense than the first story. The bickering Satan and God and the occasional musical interruptions both feel like they belong in other movies entirely. Richard Moll plays characters in the first and last story and is engaging, menacing, and enjoyable to watch. Cameron Mitchell obviously is just there for the paycheck. The rest of the cast is a mixed bag, but that mix is mostly various flavors of terrible. The special effects are plentiful and cheap, consisting of monster puppets and stop-motion beasts that have an undeniable charm, even if they fail to frighten. 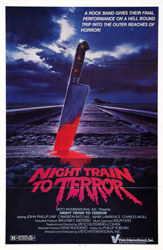 ‘Night Train to Terror’ is exactly like watching a train wreck, it’s an awful mess that you simply cannot turn away from. It’s not a film you watch for the stories (there really aren't any), you watch it because you can’t wait to see what sort of nonsense is going to be thrown on the screen next, and this is a film that rarely fails to deliver.